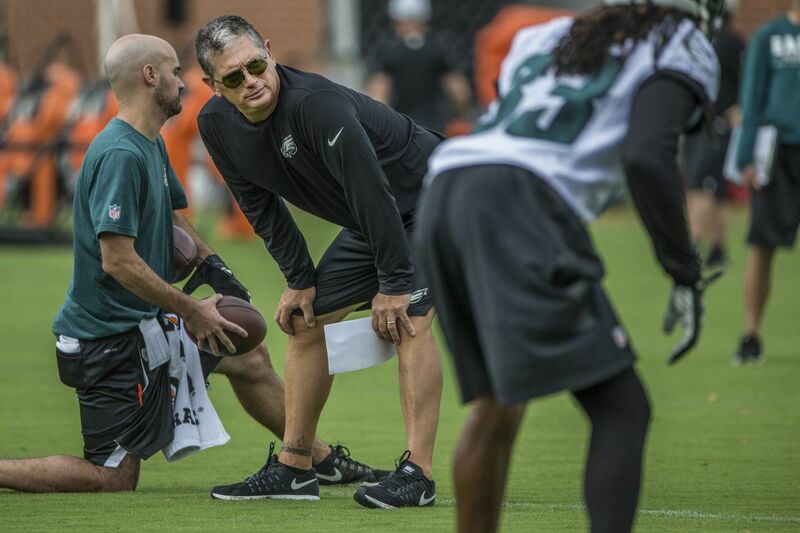 Eagles defensive coordinator Jim Schwartz during training camp at the NovaCare Complex on Monday, July 24, 2017. The Eagles will have a cornerback competition this summer, and there's no target date to determining the starters. The reason is that defensive coordinator Jim Schwartz considers the position a wide-open race and doesn't yet know who will fill such key roles. It also speaks to just how much of a problem the position could be for the Eagles, considering they're not choosing from a group of established players. "We're going to have to keep an open mind and let it play," Schwartz said. "If we close that competition too soon, I don't know if we serve the position the best way. We'll let the chips fall." Schwartz wishes this wasn't the predicament. He referenced positions such as safety, linebacker, and defensive tackle where the Eagles know who their starters will be going into training camp. That's a nice entry point for the coach, but those depth charts offer more solutions than what Schwartz has at cornerback. "At corner," Schwartz said, "we really don't have that." Jalen Mills is a likely starter. Patrick Robinson, Rasul Douglas, Ron Brooks, C.J. Smith, and Aaron Grymes are competing to start on the other side. The Eagles also need to determine their nickel-cornerback situation if they don't keep Malcolm Jenkins in the slot. Brooks, Mills, and Robinson would be candidates for that role, too. And then there is the likelihood that the Eagles will seek help elsewhere. There could be a trade or a signing before the season to solidify the position. That player could even be a potential starter, although it's hard to find those players in August. First, the Eagles will see what they have internally. And that could take time – perhaps up through the third preseason, when the starters usually play into the second half. "I'd like to do it tomorrow, but that's not just where we are," Schwartz said. "And any decision we make now, you're just predetermining the race. It'd be nice to predetermine the race."